Full Council Minutes – Page 3: In relation to the comments at the top of page 3 – the figures quoted in relation to right to buy income were historic in that they covered a 10 year period, but included income this council received up to the end of March this year. This Council received £300,000 in right to buy income in the last financial year – so it is not all that historical. The two Cabinet members stated that “the Council no longer received any funding” in this regard. This Council is likely to receive right to buy income this current financial year. 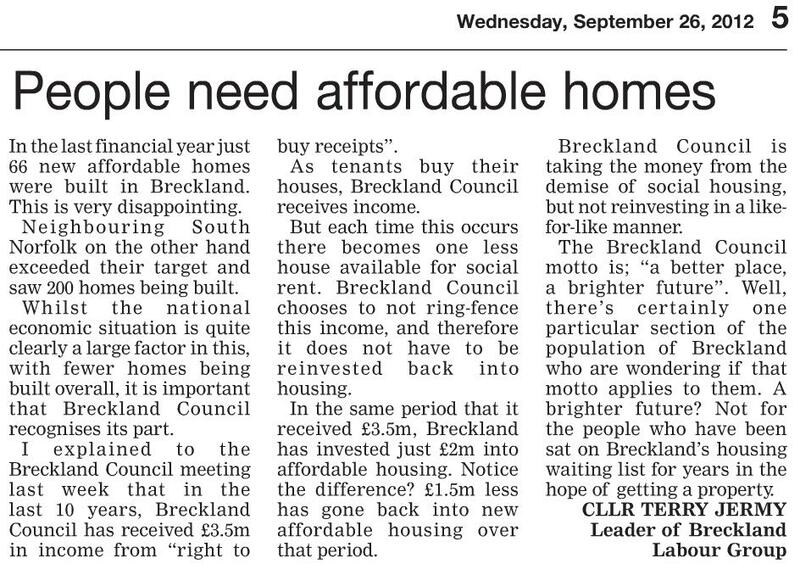 The point remains, Breckland has still taken £1.5 million away from affordable housing in the district, and it not ring-fencing this income and therefore not reinvesting it in a like for like manner. Isn’t it about time that this Council became serious about affordable housing - I spoke last time about South Norfolk Council achieving a far better result than Breckland in delivery terms. More recently of course we’ve learnt that West Norfolk Council is looking to build up to 700 homes and has pledged funding to get this project going, this will no doubt be a much welcomed boost for that area. Will Breckland continue to watch others, or will it start to address the clear demand in its own District? Cabinet Minutes – Page 12: Having been involved in the housing task and finish group I do support the recommendation to accept the revised allocations policy. However, if I may, I would like to offer a brief word of caution. By revising the eligibility criteria, the number of people sat on the housing waiting list will inevitably be decreased. But these people do not simply disappear, they still exist and are forced to find alternative accommodation. In many situations this accommodation is sub-standard – this places a much greater responsibility on the Councils private sector housing team to ensure that people are not suffering at the hands of unscrupulous landlords and those that take advantage of peoples unfortunate circumstances. In addition to this, one aspect that we did not touch upon to any great extent during the task and finish group was in relation to shared ownership. 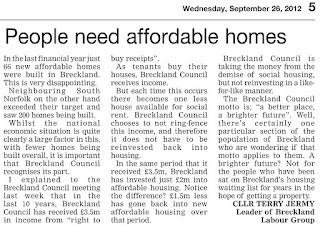 I believe the ambition to own ones own home is a good one, and as a Council I’d like to see greater commitment to getting people onto the property ladder and to consider what else Breckland could do to enable this.